Nephrologists are frequently called on to diagnose and treat renal disorders in pregnant women. In this review, we update recent literature pertinent to pregnancy and renal disease. We initially begin by describing the application of common clinical estimators of GFR and proteinuria in pregnancy and then summarize recent studies regarding pregnancy in women with chronic kidney disease and the latest information on the use of common renal medications in pregnancy. In the final section, we describe advances in our understanding of the pathophysiology of preeclampsia and the potential clinical implications of these discoveries for screening, prevention, and treatment of preeclampsia. In recognizing renal disease, measurement of kidney function and proteinuria are the early standard bearers of subclinical pathology. With the dramatic hormonal and hemodynamic changes of pregnancy, renal function is altered and these changes must be considered when assessing renal function in pregnancy and in the choice of medications provided through parturition. Renal function and filtration are also affected in preeclampsia, and recent advances have greatly expanded our understanding of the pathophysiologic mechanisms of this pregnancy-specific renal syndrome. The physiologic increase in GFR during pregnancy normally results in a decrease in concentration of serum creatinine, which falls by an average of 0.4 mg/dl to a pregnancy range of 0.4 to 0.8 mg/dl.1 Hence, a serum creatinine of 1.0 mg/dl, although normal in a nonpregnant individual, reflects renal impairment in a pregnant woman. The Modification of Diet in Renal Disease (MDRD) formula, which estimates GFR using a combination of serum markers and clinical parameters, has become a standard clinical method to estimate renal function in patients with chronic kidney disease (CKD). The use of this formula has not been well studied in the pregnant population, and guidelines on application of the MDRD formula specifically exclude interpretation in pregnant women. Creatinine-based formulas developed in nonpregnant populations are likely to be inaccurate when applied to pregnant women. For example, the fall in serum creatinine during pregnancy reflects not only the pregnancy-induced increase in real GFR but also hemodilution resulting from the 30 to 50% plasma volume expansion by parturition. Perhaps more important, the MDRD formula systematically underestimates GFR as GFR rises above 60 ml/min per m2. This inherent inaccuracy is likely to be more pronounced at the high GFR of pregnancy. Weight-based formulas, such as Cockroft-Gault, might overestimate GFR because the increased body weight of pregnancy does not typically reflect increased muscle mass or creatinine production. In 2007, the accuracy of the MDRD formula in pregnant women was formally evaluated for the first time in two prospective studies.2,3 Smith et al.2 compared the performance of the modified MDRD formula (based on age, serum creatinine, and gender) with inulin clearance in three groups of women: healthy pregnant volunteers, women with preeclampsia, and pregnant women with CKD before pregnancy. Among healthy pregnant women, creatinine clearance by 24-h urine collection closely approximated GFR by inulin clearance; however, the MDRD underestimated GFR by >40 ml/min, a degree of bias that is somewhat higher than observed in nonpregnant kidney transplant donors with normal renal function (29 ml/min).4 Among pregnant women with preeclampsia or CKD, the MDRD formula performed slightly better, underestimating GFR by 23.3 and 27.3 ml/min, respectively; however, the average GFR of all three groups was >60 ml/min, a GFR range for which the MDRD formula is also biased in the nonpregnant population. Hence, the bias the authors reported likely represents the inaccuracy of the MDRD equation when applied to any patient with near-normal renal function, regardless of whether pregnant. Alper et al.3 studied GFR estimation in a cohort of 209 women with preeclampsia. They compared creatinine clearance by 24-h urine collection, the Cockroft-Gault formula, and two versions of the MDRD formula. Not surprising, they found the Cockroft-Gault formula overestimated GFR by approximately 40 ml/min, whereas the MDRD formulas underestimated GFR (by 19.68 ml/min for the full MDRD and 12.6 ml/min for the modified MDRD). As in the study by Smith et al.2, the mean GFR in their study participants was well over 60 ml/min, a GFR range for which the MDRD formula is known to be inaccurate. There are no published data on the accuracy of the MDRD formula in pregnant women with GFR <60 ml/min. Given these issues, 24-h urine collection for creatinine clearance remains the gold standard for GFR estimation in pregnancy. The urine protein-to-creatinine ratio (P:C ratio) has become the preferred method for the quantification of proteinuria in the nonpregnant population, because of high accuracy, reproducibility, and convenience when compared with timed urine collection.5 The quantification of proteinuria in pregnancy is indicated in at least two clinical situations. The first is monitoring of proteinuria in pregnant women with preexisting proteinuric kidney disease. In this situation, the assumptions behind use of the P:C ratio in nonpregnant patients (in effect, steady state with regard to creatinine production and excretion) would be expected roughly to hold, and the ratio can and should be used to follow changes in proteinuria during pregnancy. The second important indication for the quantification of proteinuria in pregnancy is for the diagnosis of preeclampsia. Preeclampsia is defined by the American College of Obstetrics and Gynecology6 as the new onset of hypertension (BP >140/90) and proteinuria (≥300 mg protein in a 24-h urine collection) after 20 wk of gestation. Routine obstetric care includes dipstick protein testing of a random voided urine sample at each prenatal visit, a screening method that has been shown to have a high rate of false-positive and false-negative results when compared with 24-h urine protein measurement.7 Twenty-four-hour urine collection, although the gold standard for proteinuria quantification, has several limitations. It is cumbersome for the patient, it often is inaccurate because of undercollection, and result availability is delayed for at least 24 h while the collection is being completed. The use of the P:C ratio to estimate 24-h protein excretion for the diagnosis of preeclampsia has been controversial. Several studies have compared P:C ratio with 24-h urine collection in this setting, with discordant conclusions. These studies vary in the study population and the threshold used to define an abnormal ratio. Nevertheless, a meta-analysis involving 974 pregnant women from 10 studies showed a pooled sensitivity of 90% and specificity of 78% using P:C ratio cutoffs between 0.19 and 0.25, as compared with the gold standard of 24-h urine protein excretion (>300 mg/d).8 Most misclassifications tended to occur in women with borderline proteinuria (250 to 400 mg/d).9 Hence, it is reasonable to use the urine P:C ratio for the diagnosis of preeclampsia, with 24-h collection undertaken when the result is equivocal. The literature on pregnancy in women with CKD is dominated by single-center, retrospective, and often uncontrolled studies with heterogeneous definitions of kidney disease and of adverse renal and pregnancy outcomes. Fortunately, there is good evidence to suggest that women with only mild renal impairment, normal BP, and little or no proteinuria have good maternal and fetal outcomes, with little risk for accelerated progression toward ESRD or preterm delivery.10,11 Although few data are available regarding pregnancy outcomes in specific renal diseases, current consensus suggests the degree of renal insufficiency, rather than the underlying renal diagnosis, is the primary determinant of outcome. Moderate to severe CKD results in an increased risk for pregnancy complications and neonatal morbidity: More than 70% of women who become pregnant with a serum creatinine >2.5 mg/dl will experience preterm delivery, and >40% develop preeclampsia.12,13 Pregnancy also may result in deterioration in renal function in some women, although causality has been difficult to establish. In a landmark 1996 study by Jones and Hayslett,13 women who initiated pregnancy with a serum creatinine >2.0 mg/dl had a high (33%) likelihood of an accelerated decline in renal function during or immediately after pregnancy. A recent study by Imbasciati et al.14 is the only study thus far to compare prospectively the rate of GFR loss before and after pregnancy in a cohort of women with stages 3 through 5 CKD. They found the rate of decline in GFR was not significantly different after delivery compared with before conception in the entire cohort of women with serum creatinine >1.5 mg/dl; however, an accelerated rate of GFR loss after delivery was observed in the subgroup of women with both estimated GFR <40 ml/min per 1.73 m2 and proteinuria >1 g/d before pregnancy. This group should be considered especially high risk for both renal loss and pregnancy complications, and pregnancy should probably be avoided. Widely known teratogenic effects of angiotensin-converting enzyme inhibitors (ACEi) include fetal hypotension, anuria-oligohydramnios, growth restriction, pulmonary hypoplasia, renal tubular dysplasia, neonatal renal failure, and hypocalvaria. These effects occur with second- and third-trimester exposure to ACEi and carry a neonatal mortality rate as high as 25%.17 Surviving infants have an increased risk for impaired renal function and hypertension in childhood and early adulthood.20 A similar pattern of fetal anomalies has been reported with second- and third-trimester exposure to angiotensin II receptor antagonists.21,22 First-trimester exposure to ACEi was previously considered innocuous, and continuation of ACEi early in the first trimester was considered safe by many practitioners; however, the first large epidemiologic study of first-trimester exposure to ACEi reported a higher rate of major congenital abnormalities (primarily cardiovascular and central nervous system malformations) compared with unexposed pregnancies (7.1 versus 2.6%).23 Thus, it is now recommended that ACEi and angiotensin receptor blockers be discontinued before conception and that patients be educated regarding the use of appropriate birth control while taking these agents. In addition, women with inadvertent first-trimester exposure to ACEi or angiotensin receptor blockers should be evaluated by detailed fetal ultrasound and echocardiography in midgestation to screen for congenital abnormalities. There are few to no data on the safety of aldosterone antagonists or renin inhibitors in pregnancy. Given the established teratogenicity of ACEi and the key role of the renin-angiotensin-aldosterone system in fetal development, the use of these drugs in pregnancy is generally contraindicated. Since 2003, evidence has accumulated supporting the central role of placental antiangiogenic factors, including soluble fms-like tyrosine kinase-1 (sFlt1), in the pathogenesis of preeclampsia (Figure 1). sFlt1 is a circulating antagonist to both vascular endothelial growth factor (VEGF) and placental growth factor (PlGF) and is overexpressed in the placenta of women with preeclampsia. The original rat model of sFlt1-induced preeclampsia25 has been reproduced by others.26 Animal models of preeclampsia based on induction of uteroplacental ischemia in both rats and primates are characterized by increased circulating and placental sFlt1.27,28 In women with preeclampsia, uterine vein sFlt1 concentration exceeds antecubital vein sFlt1, confirming a fetoplacental source of excess circulating sFlt1.29 There are now more than a dozen studies confirming that circulating levels of sFlt1 and one of its targets, the proangiogenic PlGF, are altered several weeks before the onset of clinical signs and symptoms of preeclampsia—in the case of PlGF, as early as the first trimester. There is evidence from mouse models that VEGF is important in maintaining glomerular endothelial cell health and healing, and its absence induces proteinuria and thrombotic microangiopathy resembling pathologic glomerular changes of preeclampsia.30 These diverse findings support the theory that altered placental expression of angiogenic factors, induced or exacerbated by placental ischemia, is a major contributor to endothelial dysfunction in preeclampsia. Summary of a current view of pathogenesis for preeclampsia. Placental dysfunction, triggered by poorly understood mechanisms—including genetic, immunologic, and environmental—plays an early and primary role in the development of preeclampsia. The damaged placenta in turn secretes the antiangiogenic factors, sFlt1 and sEng, into the maternal circulation. These factors lead to impaired VEGF/PlGF and TGF-β signaling, resulting in systemic endothelial cell dysfunction mediated by a variety of factors, as shown. 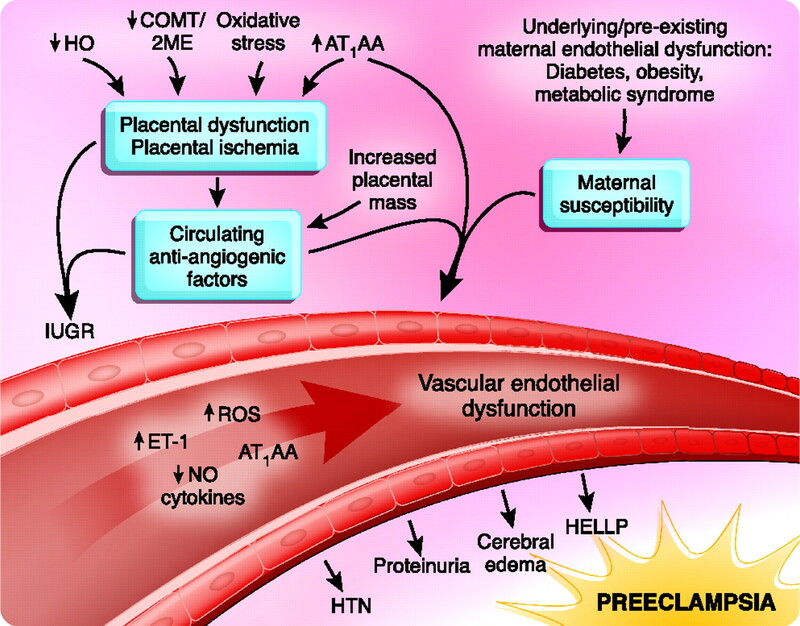 Endothelial dysfunction, in turn, results in the systemic manifestations of preeclampsia. HO, heme oxygenase; AT1AA, angiotensin type 1 agonistic autoantibodies; COMT/2ME, catechol-O-methyl-transferase and 2 methoxyestradiol; sFlt1, soluble fms-like tyrosine kinase-1; sEng, soluble endoglin; ET-1, endothelin 1; ROS, reactive oxygen species; NO, nitric oxide; IUGR, intrauterine growth retardation; HELLP, hemolysis, elevated liver enzymes, low platelets. Angiogenic factors provide insight into the pathophysiology of several established preeclampsia risk factors. For example, preeclampsia is strongly associated with both first pregnancies and multiple-gestation pregnancies. Higher serum sFlt1 levels are observed in both of these groups, as compared with second pregnancies and singleton gestations, respectively.36,37 Similarly, pregnant women whose fetuses are affected by trisomy 13 (a condition associated with increased preeclampsia risk) have higher circulating sFlt1 levels as compared with control subjects,38 possibly as a result of the extra copy of the sFlt1 gene, which resides on chromosome 13. Smoking is associated with both a reduced risk for preeclampsia39,40 and lower circulating sFlt1 levels in both pregnant33,41 and nonpregnant42 individuals, as compared with nonsmokers. Cigarette smoke extract reduces sFlt1 production by placental cells in vitro.43 The molecular mechanism by which smoking downregulates sFlt1 (thereby lowering preeclampsia risk) is unknown, but this response is not surprising given the known proangiogenic effects of nicotine.44 Nevertheless, no one recommends smoking during pregnancy. Several preeclampsia risk factors—including chronic hypertension, diabetes, and obesity—are related to underlying maternal endothelial dysfunction. These women may be more susceptible to the adverse endothelial effects of antiangiogenic factors. If so, then preeclampsia would be expected to develop at a lower threshold of circulating sFlt1 in women with these maternal endothelial risk factors compared with previously healthy women. Indeed, sFlt1 levels are lower in obese women with established preeclampsia as compared with normal-weight women with preeclampsia.45 Similarly, women with preeclampsia in association with relatively low levels of circulating sFlt1 were found to have higher BP at booking (13 to 20 wk gestation) compared with women with high-sFlt1 preeclampsia,46 suggesting subclinical endothelial dysfunction may result in a lower sFlt1 threshold for the development of preeclampsia. Whether other vascular risk factors, such as chronic hypertension and diabetes, have a similar pattern remains to be seen. The molecular pathways affecting sFlt1 and sEng expression and how these might relate to other theories of the pathogenesis of preeclampsia are just emerging. Heme oxygenase (HO), an anti-inflammatory enzyme with antioxidant properties, attenuates VEGF-induced sFlt1 expression.47 Diminished HO activity has been observed in women with preeclampsia48,49 and mediates increased placental sFlt1 and sEng expression. This observation suggests a potential therapeutic use of statins in preeclampsia, because these agents upregulate HO-1 and decrease VEGF-induced sFlt1 release from placental villous explants47; however, adverse fetal effects will first need to be excluded in clinical trials, a critical standard for any novel preeclampsia therapy. A potential role for agonistic autoantibodies to the angiotensin AT1 receptor (AT1-AA) in the pathogenesis of preeclampsia has developed in recent years. Elevations in circulating levels of AT1-AA in women with preeclampsia were first described in 199950 and posited to mediate the enhanced vascular reactivity to angiotensin II and possibly the endothelial dysfunction that are characteristic of preeclampsia. Although subsequent work has shown these autoantibodies are not specific for preeclampsia, there remains significant experimental evidence to suggest they may play an important pathogenic role. AT1-AA are linked to oxidative stress and decreased trophoblast invasion,51 and circulating levels increase in a transgenic mouse model of preeclampsia.52 AT1 receptor autoantibodies stimulate trophoblast sFlt1 production in vitro and therefore may mediate excess sFlt1 production by the placenta in preeclampsia53; however, AT1-AA have not been temporally correlated to the clinical phenotype of preeclampsia in large clinical studies. Recently, deficiency of placental enzyme catechol-O-methyl-transferase (COMT) and 2-methoxyestradiol (2-ME) was also associated with preeclampsia.54 Mice deficient in COMT develop preeclampsia-like signs and symptoms that are rescued by exogenous therapy with 2-ME, possibly through inhibition of hypoxia-inducible factor 1-α and downstream targets such as sFlt1. The investigators also demonstrated that human placenta obtained from patients with preeclampsia are deficient in COMT, which is accompanied by low circulating levels of 2-ME. More work is needed to understand the precise role of COMT during normal and abnormal pregnancies. The ability to detect preeclampsia before the onset of hypertension, proteinuria, and other overt manifestations of disease will probably be the first application of angiogenic factors in the clinical management of preeclampsia. To date, more than a dozen independent studies have verified significant changes in PlGF, sFlt1, or sEng before the onset of preeclampsia.33,35,55–69 Changes in PlGF are seen by the first trimester,67–69 whereas reproducible alterations in sFlt1 and sEng are observed in the mid to late second trimester onward. PlGF is excreted in the urine at lower levels in preeclampsia, and measurement of urinary PlGF may have a role in preeclampsia screening70 or diagnosis.71–73 Combining these three biomarkers into a single angiogenic index33,55,65 or with uterine artery Doppler74–77 may be more predictive than any single marker. Placental protein-13 (PP-13) has also emerged as an early biomarker for preeclampsia and other disorders related to inadequate placentation. PP-13 is a placenta-specific protein that is involved in normal implantation and placental vascular development. First-trimester circulating maternal serum levels of PP-13 are significantly lower in women who go on to develop preeclampsia, IUGR, and preterm birth. Some early studies suggested excellent prediction of preeclampsia by first-trimester serum PP-13,85 although other work suggested PP-13 is a robust biomarker only for early-onset disease and is less useful for preeclampsia occurring closer to term.86 Combining first-trimester PP-13 serum screening with uterine artery Doppler may further improve prediction.87 Mutations in LGALS13, the gene encoding PP-13, have been detected in cases of preeclampsia.88 This polymorphism may result in production of a shorter splice variant of PP-13 that is not detected by conventional assays, contributing to low circulating levels and decreased local activity of PP-13 in some cases of preeclampsia. A screening tool for preeclampsia will have the greatest impact on clinical outcomes when effective prevention or treatment becomes available. To date, no effective prevention is available for preeclampsia, and management is supportive, with delivery of the neonate the only definitive treatment. Nevertheless, early diagnosis of preeclampsia with angiogenic biomarkers is likely to improve clinical outcomes using interventions currently at hand. For example, intensive monitoring of screen-positive patients will allow for timely intervention with antihypertensive medications, bed rest, magnesium for seizure prophylaxis, steroids for fetal lung maturity, and expedient delivery (when appropriate). The effect of screening on clinical outcomes using these methods will need to be proved. The greatest potential impact of screening and early diagnosis will depend on new treatment or prevention strategies for preeclampsia, based on altering the placental production or endothelial effects of angiogenic factors. Interventions that allow delivery to be safely postponed as little as 1 wk have the potential to improve neonatal outcomes significantly in preeclampsia.89 Such treatments are further on the horizon but hold the greatest hope for the transformation of our care of women with preeclampsia. Several medications and new therapies may play a role in the management of preeclampsia. The theoretical benefits of aspirin are based on prominent alterations in prostacyclin-thromboxane balance in preeclampsia. Aspirin for the prevention of preeclampsia has been extensively studied. Dozens of trials have produced mixed results, culminating in three large randomized, controlled trials, with a cumulative enrollment of 12,000 high-risk women in the mid-1990s.90–92 All three studies found a small, nonsignificant trend toward a lower incidence of preeclampsia in the aspirin-treated groups. A comprehensive meta-analysis published in 2004, subsequently reinforced by a second meta-analysis in 2007, combined randomized, controlled trial data on >32,000 women of varying risk status from 31 trials. Both meta-analyses suggested a small but significant overall benefit, with a relative risk for preeclampsia of 0.81 to 0.90 for aspirin-treated patients.93,94 A small reduction in the risk for early preterm birth was also observed in both analyses. Low-dosage aspirin seems to be safe: Early concerns of an increased risk for postpartum hemorrhage have clearly been assuaged. Given the small but significant protective effect, aspirin prophylaxis should be considered as primary prevention for preeclampsia, especially for women who are at high baseline risk and for whom the absolute risk reduction will be greatest. Nutritional supplements, including antioxidants, calcium, and folic acid, all have been proposed as offering protection from preeclampsia. Unfortunately, none have proved effective in randomized, controlled trials. The use of antioxidants has garnered particular enthusiasm in the past several years, fueled in part by research suggesting a major role for oxidative stress in the pathogenesis of preeclampsia; however, three large randomized, controlled trials of vitamin C and E supplementation, with sample sizes ranging from 700 to 2400 women, showed no benefit in high-risk95,96 or in healthy, nulliparous women.97 A larger trial sponsored by the National Institutes of Health Maternal-Fetal Medicine Units Network, with anticipated enrollment of 10,000 low-risk women, is ongoing; however, the current data do not support the routine use of antioxidants for the prevention of preeclampsia. Calcium supplementation is not effective in women with normal or high baseline calcium intake but may be beneficial in populations with low (<600 mg/d) dietary calcium intake.98,99 Folic acid has been suggested to be protective by observational data,100 but no randomized, controlled trials are yet available to support this claim. Endothelial damage in preeclampsia is mediated, at least in part, by disruptions in balance between proangiogenic (VEGF, PlGF, and TGF-β) and antiangiogenic (sFlt1 and sEng) circulating factors. Given this, interventions that seek to reestablish angiogenic balance hold promise for the prevention or treatment of preeclampsia. In a rat model of sFlt1-induced preeclampsia, recombinant VEGF-121 ameliorated hypertension and renal damage.101 Other strategies that may be explored include the use of placental growth factor; mAbs to sFlt1 or sEng; small-molecule inhibitors of sFlt1 or sEng action; or agents that enhance endogenous VEGF, PlGF, or TGF-β production. Another potential treatment strategy for preeclampsia capitalizes on the role of nitric oxide (NO) in the pathogenesis of disease. The endothelial protective effect of VEGF and PlGF in normal pregnancy is mediated by NO, and impaired NO synthesis may contribute to endothelial dysfunction in preeclampsia. Women with preeclampsia have high circulating levels of asymmetric dimethylarginine, an endogenous inhibitor of NO synthase, even before the clinical onset of disease.102,103 Hence, NO donors or precursors, such as l-arginine, might be effective for the prevention or treatment of preeclampsia. Although clinical studies thus far have been too small to show a conclusive benefit,104 pilot data suggested l-arginine may prolong pregnancy and reduce BP in women with gestational hypertension.105 Larger studies are needed to determine whether l-arginine or other interventions aimed at restoring endothelial NO activity are safe and effective for preeclampsia. There remain significant challenges to the development of new treatments for preeclampsia, and it is unclear whether these novel therapies will prove to be safe and effective. Nevertheless, it is exciting to witness advances in our understanding of the pathophysiology of preeclampsia that have the potential finally to lead to treatment options for this challenging disease. S.E.M. is a co-inventor on a patent filed on behalf of Beth Israel Deaconess Medical Center for the use of angiogenesis-related proteins for the diagnosis and treatment of preeclampsia. R.T. is a co-inventor on patents filed on behalf of the Massachusetts General Hospital and licensed to multiple diagnostic companies for the use of proteins including angiogenesis-related proteins for the diagnosis of preeclampsia. R.T. also serves as a consultant to the following diagnostic companies pursuing preeclampsia tests: Abbott Diagnostics, Beckman Coulter, Roche Diagnostics, and Ortho Clinical Diagnostics. S.E.M. is supported by the Charles E. Culpeper Scholarship in Medical Sciences. R.T. is supported by grant DK67397 from the National Institutes of Health. Pregnancy in Dialysis Patients: Is the Evidence Strong Enough to Lead Us to Change Our Counseling Policy?